- Support any USB storage device (up to 4 TB, Mac formatted hard disk is not supported) including: external hard drives, flash drives, memory cards, etc. Cons: range seems limited, as expected. Pros: Looks like it will be an awesome little piece of equipment! Cons: User manual is the most user UNFRIENDLY manual I have ever tried to navigate. There is no clear starting point and steps seem to step all over themselves. Internet search wasn't much better. Company tech support was helpful, but ultimately determined I was shipped a defective unit. Pros: Any storage can be connected to the USB and accessed via regular windows explorer just like any shared folder on network, without the need of any other app. Just type \\<ip of the router> OR \\<device name> (in my case my router's name is TM02 so \\TM02)on windows explorer and you can access all the files. I can confirm this works on my windows machine. I also am able to access the files the same way using the ESFileExplorer on Android. Go to LAN in ESFile and add the same way. The user id and password to access the storage is the user id and password to access the admin page of the router which in my case was defaulted to userid: "admin" and no password. Hope this helps people trying to access storage which can be actually done without any app. Cons: Signal reach may feel a little restricted. Pros: Does exactly what I needed it to do. Wow is it tiny. Micro USB power is awesome. Other Thoughts: I have numerous devices, so when I travel, having to go through the hotel acceptance page on each one is bothersome. With this device, you set the connection up once per device, then never have to change it. Cons: Busy, garish UI. Lots of menu levels, animations, and junk. Other Thoughts: It isn't quite in OpenWRT yet but there is a GitHub tree that allows installation (you need a USB stick). It has a few glitches since it is "off tree" but generally works if you prefer that. to the busy, complex UI. That said, if you can just configure and forget, the UI won't be an issue. It is a worthy competitor to the TP-WR703 with twice the flash memory, and similar capability. I have to give it 4 eggs for the value, but I was originally gong to give it 3. Like a car with a great engine but bad exterior. Pros: Small, light, cute, powerful. Both my wife and I like it!. I have ordered a 2nd one for myself. The first one was given to my wife, so she could share files and pictures with her classmates by using iPads in a room that has no Wi-Fi coverage. Pros: I got the HooToo Nano for a trip that I was taking where I would be staying in hotels and using the hotel public Wi-Fi.. Often times I have to remote into the office servers to do some work. To avoid security issues in the past, I had to use my phone as a hotspot but that ends up using a lot of my data. 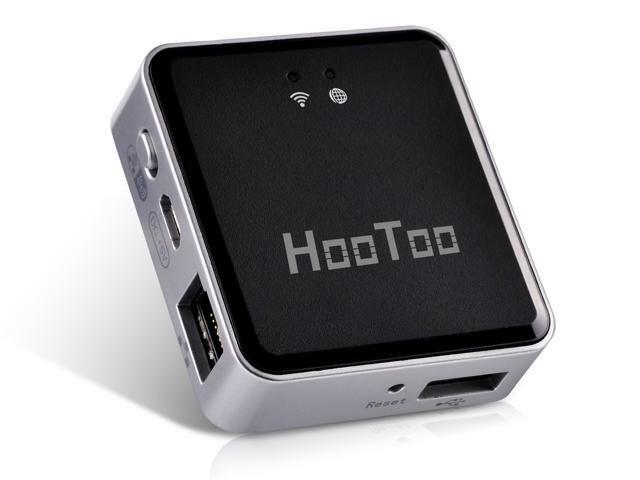 The HooToo was a perfect solution that allows me to set up my own private network. However, I'm glad I did some reading before I went on the road. There is a firmware upgrade that is required to do this in a hotel or other public network. I would have been frustrated if I had been on the road and it didn't work out of the box. But, I installed the upgrade and had no issues. The USB media sharing is a great feature. I run a relatively small SSD on my laptop and don't want to fill it with music. So I just loaded up a thumb drive with all my favorite music and threw it in my bag. That way I can access the music from both my laptop and my phone without having to have all my devices running through my laptop. I can shut off my laptop and still have access to my music through the HooToo app on my phone. P.S....it helps to have a little wall charger or an always on USB port on your laptop so you don't have to leave your laptop turned on. Cons: Needed a firmware upgrade but that is documented and available through their website so it's not a big deal. Pros: Small and light weight with a ton of great features. I have been using this at hotels to get a higher speed connection compared to the supplied wi-fi of most hotels. I hook it up to the wired conneciton in my room and away I go. I have paired it with a Chromcast and now I have a home entertainment system in any hotel I travel to. Last trip I had my chromcast and 3 other devices connected and streaming with not a single sign of a hicup. Best $20.00 I have spent on a travel type item. Cons: Have to supply your own power for the device. Other Thoughts: For the price and the features I would buy more of these. Great product.